My experience with the original Pitch Perfect was watching it with my little sister whose quirky taste in movies aligns beautifully with mine. I hadn’t heard the hubbub about the movie (since I live under a rock), but definitely enjoyed it and was excited when they announced a sequel. 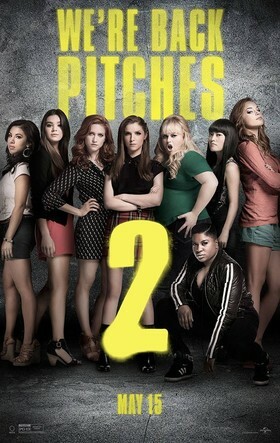 Pitch Perfect 2 takes place three years after the original so characters that were freshmen are now seniors. It quickly became pretty obvious that all of the surprise successes from the original were overemphasized in the sequel without much added value. For example, most people agreed Fat Amy (Rebel Wilson) stole the show in the original so her antics were played up to eleven in this go around. As far as new surprising successes, it was not quite so successful. Fortunately, Benji (Ben Platt) was still super cute (SO CUTE). The movie bifurcates toward the beginning and follows the story of the Bellas prepping for a big (now international) show and Beca’s (Anna Kendrick) experience at her internship while she works toward her dream of being a music producer. Beca attempts to hide her internship from the group, which is tricky since she’s in charge of creating new musical arrangements for the group’s performances. And she’s struggling at her internship too, since she’s been making mashup mixes for so long that she can’t find an original idea worth pitching to her impatient music producer boss. Maybe it’s tough to find ways to work in lots of acappella music without the classic riff-offs and multiple high tension performances. But despite the mirrored plot lines, a fair amount of different storylines do develop. In the original, the Barden Bellas were competing on a national stage, but this time it’s an international acapella competition. The biggest rivals are the team from Germany, Das Sound Machine. The black mesh tops worn by all members is only one of the uber stereotypes employed to ensure everyone watching understands this group is from GERMANY. The music we fell in love with in the first movie exists pretty similarly in the sequel. There are catchy mash-ups and all the music is carefully selected. One of the themes in the movie is tackling the “rule” in acapella of only singing covers. No originals. The newest Barden Bella fancies herself a songwriter and one of her songs (in real life written by Jessie J) is woven throughout the movie. The movie avoids having to introduce many new characters, which would have been fine if the original characters had undergone any kind of meaningful development. The developments that did take place could basically be reduced to not wanting to grow up (Chloe [Brittany Snow] kept failing classes so she could stay in college and keep singing in the Barden Bellas, making her a seventh year senior), wanting a deeper relationship than just hooking up, and trying to figure out what to do after college. There were really two key new characters who had any kind of development: one new Bella (Hailee Steinfeld) and Beca’s music producer boss (Keegan-Michael Key) at the company where she becomes an intern. Other secondary characters were introduced but mostly relied on stereotypical one-liners, which made the group’s “diversity” seem pretty forced. The formerly inaudible Lilly (Hana Mae Lee) is actually audible in this movie, and, although that ruins her allure, the things that come out of her mouth are pretty priceless. The misogynistic/hilarious commentary by Elizabeth Banks (also the director) and John Michael Higgins was also pretty identical to the first movie, but still incredibly humorous. It’s poignant that the insulting garbage that comes out of his mouth is meant to be inflammatory but at the same time the notions are plausibly (incredibly) shared by real people. This movie was originally pitched as a summer feminist blockbuster. While there are certainly a lot of women in the cast, I had more of a nostalgic response from the movie. I’m writing this on the heels of being reunited with some of my closest friends from college, and I was reminded of how unique college years are in comparison to real adult life. Having all my best friends living within a few blocks of me will never happen again and letting go of that is scary yet inevitable. We all can’t keep failing classes to stay in college. (Can you imagine Chloe’s student loans after seven years?!) The movie certainly celebrates female friendship and it’s nice to see women building up other women instead of tearing them down. In that sense, it’s empowering.